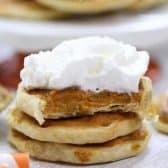 I truly love all things pumpkin! From the smell of Pumpkin Desserts baking in the oven to the spiced creamy filling in pumpkin pie, it all just warms me from the inside out! Place pumpkin in a strainer lined with paper towel. In a small bowl beat together brown sugar, egg yolk, cream cheese, flour, cream and pumpkin pie spice. Lift paper towel and give the pumpkin a very gentle squeeze to remove some of the liquid (don’t worry if the paper towel breaks and you don’t squeeze much). Add pumpkin to the brown sugar mixture and stir until combined. Unroll (or roll out) your dough. Using a 3″ cookie cutter, cut 12 circles. Place on a parchment lined pan and gently fold the edges up (approx. 1/8″) on each circle. Divide pumpkin filling over the mini crusts and smooth the top. Bake 12-14 minutes or until crust is lightly browned.